This is review No. 1 of 16 in the first round of our competition. Each review will compare four burritos, with my favorite advancing to Round 2. 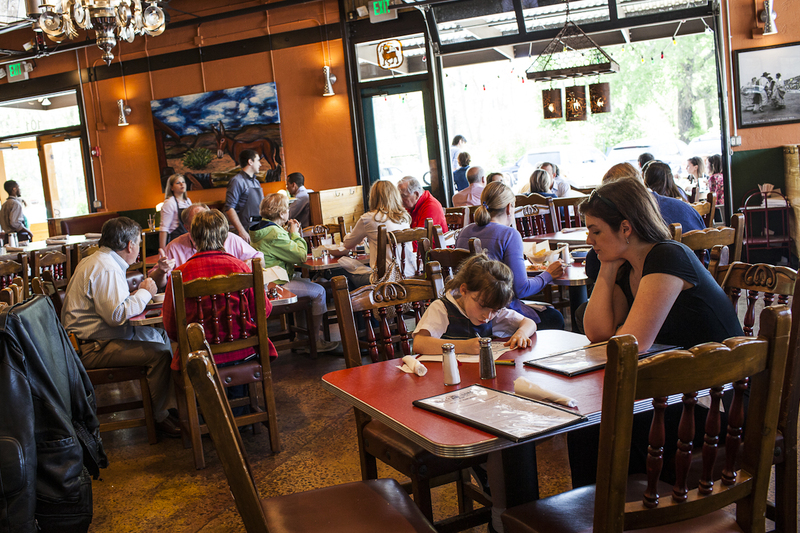 For the first competition in the South, the Burrito Selection Committee pitted two restaurants lauded by BSC member Bill Addison but loathed on Yelp against two Yelp favorites that drew the committee’s skepticism. This man-vs.-Yelp mini-challenge would end in Arlington, Virginia, and begin at the end of America — in Key West, Florida, capital of the Conch Republic. 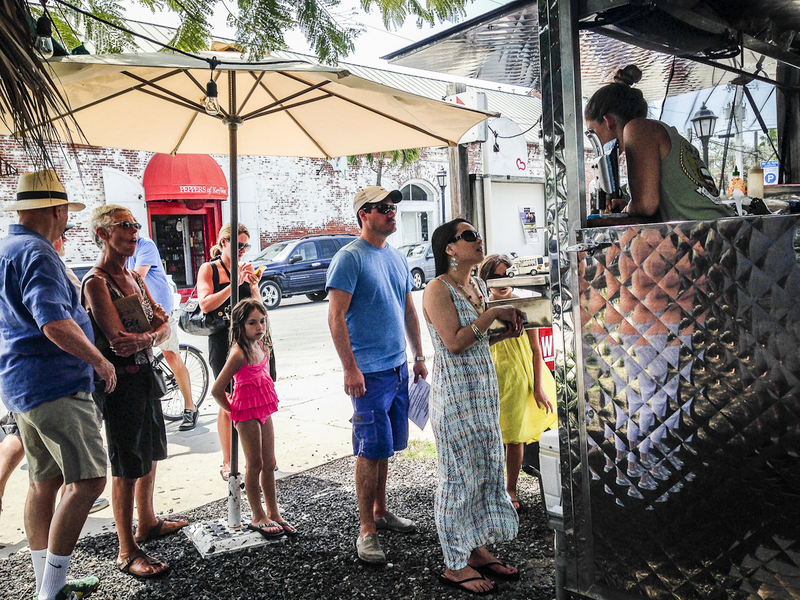 On its face, Key West is decidedly more Cheeseburger in Paradise than Burritoville. Pink plastic flamingos, Sloppy Joe’s bar, key lime pie (and, as an outlier, Ernest Hemingway’s house) are the island’s most famous attractions. So when we ran the Yelp data and found that Garbo’s Grill in Key West had the highest Value Over Replacement Burrito (VORB)1 score of any burrito-selling establishment in the southern region, I will admit I was very pleasantly surprised. What’s more, Garbo’s VORB of 13.1 puts it among the ranks of many California greats,2 and above all but one restaurant in each of the West and Northeast regions. Addison had been there, but it’s not his favorite burrito in Key West. He likes the burrito at Garbo’s, but said including it in the Burrito Bracket wouldn’t have occurred to him without the Yelp suggestion. I’d driven through the Florida Keys before, but never the entire way to Key West. It sits at the end of U.S. 1, the last in a series of small sandy islands atop the continental United States’ only living coral barrier reef. It sounds beautiful, and the closer to water you get the more lovely it is, but from the road the first few islands look to be nothing but sprawling kitsch, RV parks and souvenir stores. Arriving on the last key in the chain, I was greeted by construction cones and barriers. My hopes for Garbo’s dwindled. But Key West’s historic downtown feels like another country. (It sort of is: The city staged a mock secession and renamed itself the Conch Republic in 1982 after a showdown with Border Patrol over a roadblock that was hurting the tourism industry.) The streets feature clapboard-covered houses painted in bright pastels, roosters strolling at will and key-lime-colored everything. The silver cart that houses Garbo’s (reminiscent of a coffee cart, for the New Yorkers among us) is parked in a white-pebble-filled parking lot a block from the docks. I had intended to try the Kogi Korean Beef Shortrib burrito after reading fanatical reviews on Yelp, but unbeknownst to me, Garbo’s now alternates between fish and barbecue each day it’s open because the grill is too small to make both at once. This Saturday it was fish’s turn, so I’d just have to make do with a local catch brought in that morning. How very sad. Everything is made to order — the ingredients, neatly arranged in gallon-size Ziplock bags, sit in ice chests behind the truck that double as seats. The cashier was constantly shuffling behind the truck to pull bags of mango, jalapeño and fish from the ice. Nineties rock blasted from the speakers and a chalkboard greeted patrons, thanking them for their inevitable patience. All of the seats, hammocks and ice chests were taken, so I lingered during the long wait, chatting with enthusiastic customers. A couple from Maine explained that they’d just arrived after an 1,800-mile drive, a pilgrimage they make frequently since their boat is docked in Key West most of the year. They said the first thing they do on arrival is go to Garbo’s (pronounced Gaaaa-bows if you’re from Maine), and I couldn’t go wrong ordering. 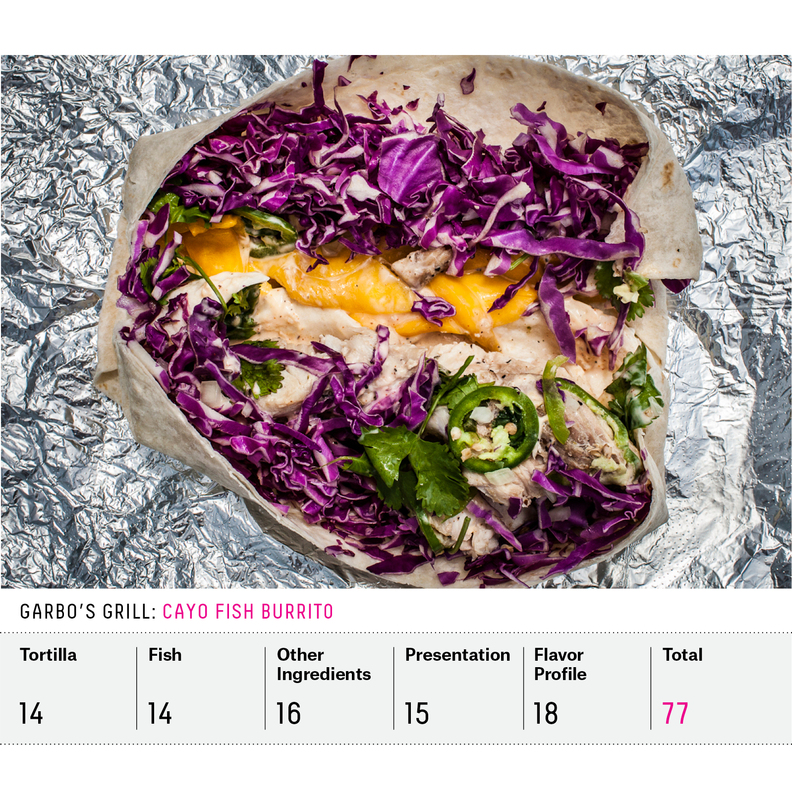 The combination of flavors in the cayo fish burrito was spectacular — spicy jalapeños, cilantro, meaty slices of mango, red cabbage, onion and a spicy aioli. There was a lot of cabbage in there, and not enough aioli to compensate for the mounds of roughage and slightly dry fish. The jalapeños were cut in thick slices, producing a few set-your-mouth-on-fire bites. But those were really the only shortcomings. The flavors are fitting for the perpetual heat and humidity of the country’s southernmost continental point; no beans, rice or cheese weigh this bad boy down. It’s also a thing of beauty, a kaleidoscope of dark purples, greens and orange inside. 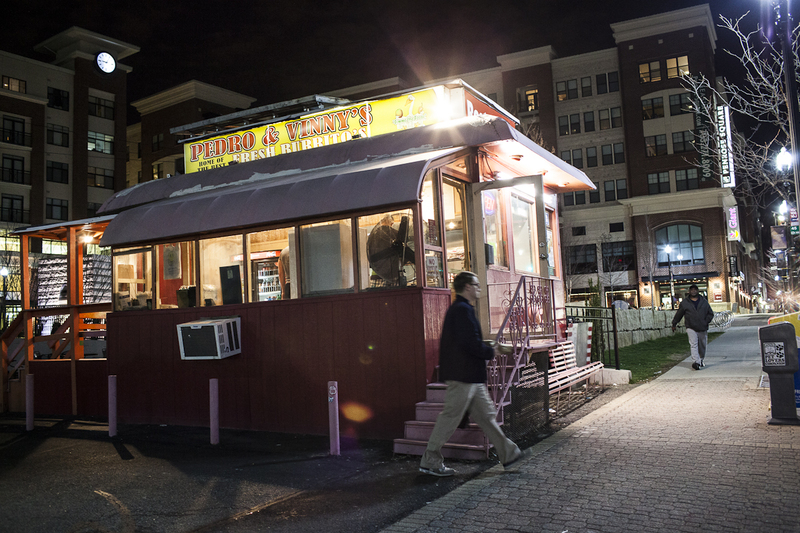 Don’t roll out of bed too late; Garbo’s is open only until 3 p.m.-ish, or whenever they run out of ingredients. So far, Yelp was one for one. I’ve lived in Miami Beach for a little over a year, and I’ve been Mexican food-deprived since I moved there (making it hard to train for the Burrito Bracket). Sure, Miami has the typical Mexican chains and a few options for a Friday night out with friends, but in a full year of searching I’ve never found my go-to cantina. 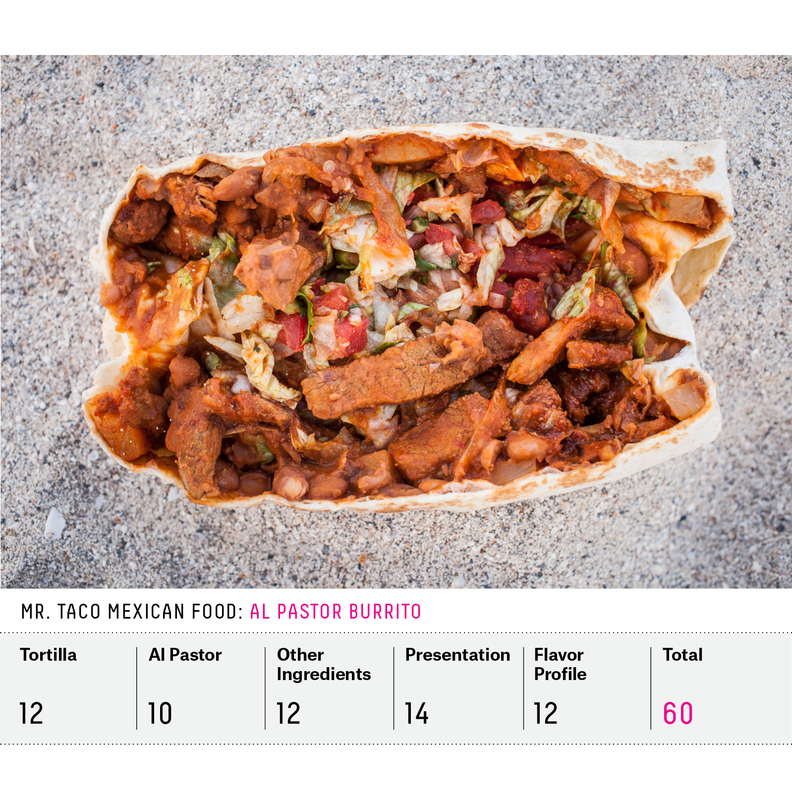 So when Addison — a critic for Eater and a board member of the Southern Foodways Alliance — told me I’d be surprised at what I’d find at Mr. Taco Mexican Food in Miami Beach, just a couple miles from my apartment, I was skeptical; its VORB score based on Yelp data was a paltry 1.3. Sadly, I wasn’t particularly surprised by Mr. Taco’s burrito. It was tasty, but didn’t have any outstanding qualities. The tortilla was good, but unevenly griddled. The al pastor was lacking in personality, as were the pinto beans. There were pieces of pineapple lying like golden treasure inside (as in any traditional al pastor), but they tasted like they were from a can — overly sweet and not flavorful. But do not despair of Mr. Taco. A fish taco also made its way to the table, and it was something special. A whole filet of moist, flaky fish laid atop a bed of avocado and sautéed corn kernels, on two fresh corn tortillas. It was beautiful, and delicious. I won’t hold it against Mr. Taco that burritos aren’t his thing; the place has many redeeming qualities in addition to tasty non-burrito fare. For starters, it’s steps away from a beautiful and quiet stretch of beach on a rare block of restaurants amid hotels and condo buildings. If I lived in walking distance, I’d be a regular. If I were on spring break, this would be an amazing find for good, cheap eats. I’ll be back, just not for the burritos. Little Donkey (translation: burrito) is located in Homewood, Alabama, an upper-class suburb of Birmingham. By just about any measure, this place is incredibly cute. It shares a parking lot with a popsicle store, an old-school shoe repair place and a coffee shop by day, bar by night. A vintage sign on corrugated tin with a font reminiscent of an old laundromat greets you from the street. The kids’ menu is on the back of a Mexican wrestler mask, and comes complete with crayons for coloring. All of these qualities should make it a Yelp favorite, but its VORB is a low 3.5, and the reviews are only lukewarm. According to Addison, however, Little Donkey serves a “come hither” burrito, and it was one of his top choices in the region. The owners of Little Donkey were already famous for their hecho-from-scratch approach to Southern barbecue, and they have dozens of locations in seven states, which explains the concept: Mexican flavors applied to Southern meat-smoking techniques. 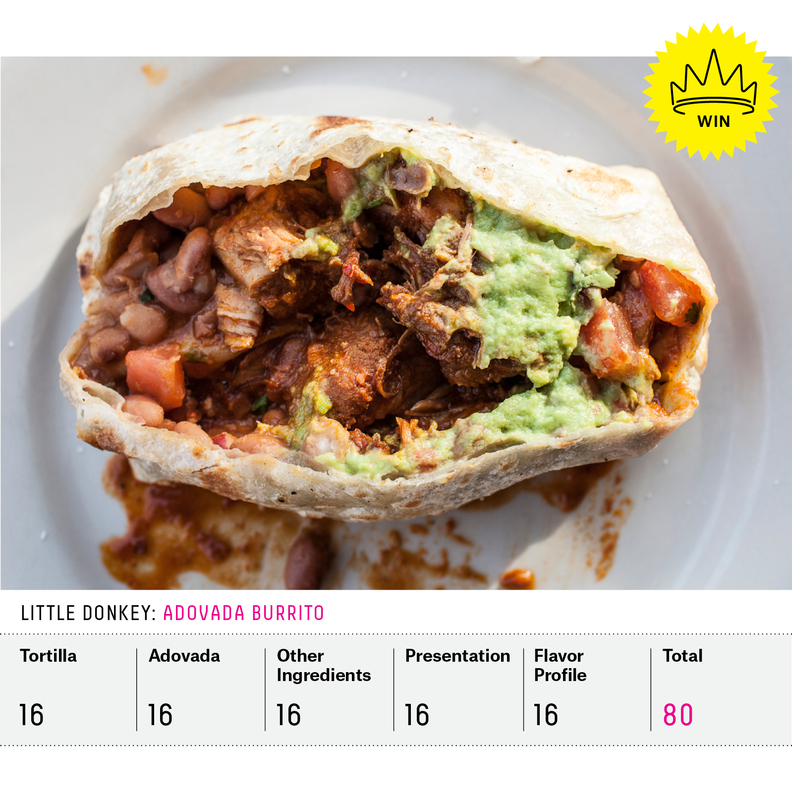 Little Donkey does it so well; just about everything in the adovada burrito sings with flavor and attention to detail. The adovada is thick pieces of pork shoulder that fall apart in silky layers, earthy chile peeking out of great smoky southern barbecue. The tortilla is rustic in texture and feel, and griddled until it’s charred in spots. The salsa isn’t spicy, but brings an air of freshness to a heavy plate of meat and beans. The guacamole was the only element that didn’t live up to its potential, but it’s a little unfair to celebrate the use of local ingredients and expect perfect avocado on a spring evening in Alabama. This is a knife and fork kind of burrito. Have a margarita. Come for sunset and sit on the patio, or sit inside in the dining room surrounded by wood and Mexican tiles. After dinner, I went for a walk in a nearby park and struck up conversation with a woman who lives in the neighborhood. When I told her where I’d eaten, she scoffed and said, “My sister lives in Atlanta and she’s married to a Mexican guy. I go there every Friday for dinner and we get real Mexican food.” True, this is not traditional Mexican, but a wonderful hybrid of two culinary traditions that seem long overdue for a love affair. Man beats Yelp big this time. Up the road from the Pentagon, in a CVS parking lot, customers enter the front of a fire-engine-red shack in a steady stream and leave out the back with brown paper bags in tow. Their goods? Tinfoil-encased monstrosities bearing just about everything the shack has to offer but the kitchen sink. 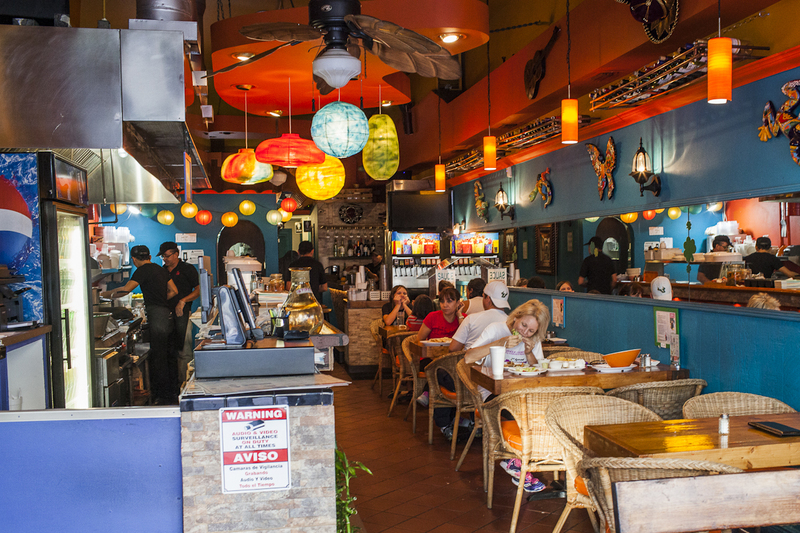 Pedro & Vinny’s has some of the most loyal Yelp fans on the Eastern seaboard. They are gluttons for these massive creations, which are thicker than my bicep and nearly as long as my forearm. Glutinous Chef’s Quality-brand tortillas are laden with cheese and heated over a steam bath before they make their way to the assembly line, leaving the casing clinging to the innards like shrink wrap. Then in goes the rest: rice, steak, cheese (jack and cheddar), corn, tomato, cucumber, lettuce, beans (pinto and black), guacamole and sour cream, all in heavy-handed proportions. It’s topped off with a choice of salsas (I went with mango habanero and cilantro habanero), wrapped up into a not-so-neat and not-so-little package. The mango habanero salsa is the winning element, sweet with a spicy hangover. The cucumber provides much-needed relief from the other ingredients. And the steak, while somewhat nondescript in flavor, had the richness of great meat, but inconsistent texture. The beans, “black and tan,” are flavorful. 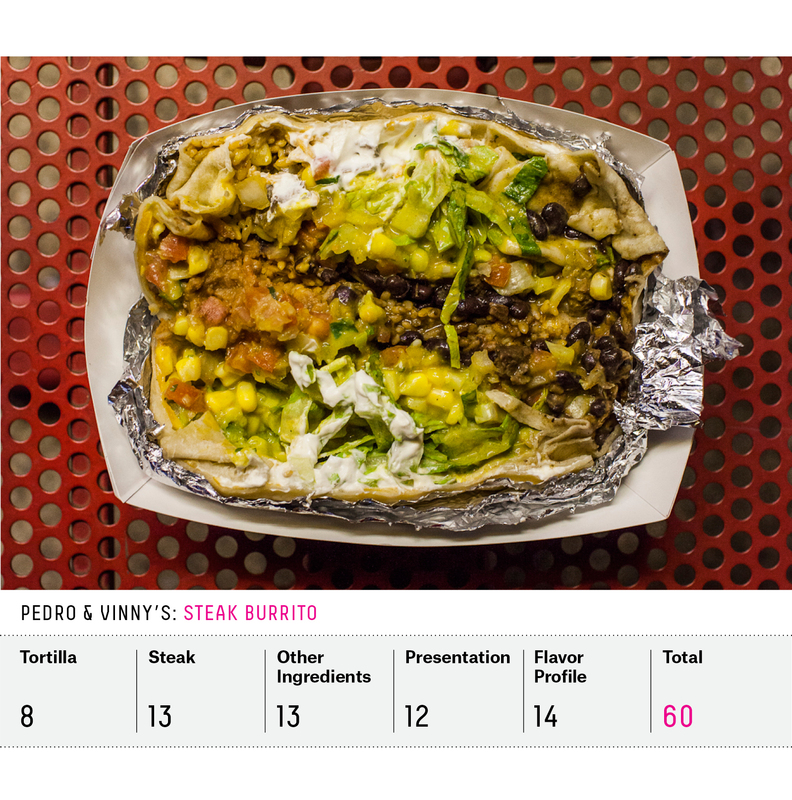 The rest of this garbage-pail-style burrito is good, but the focus here is more caloric quantity than ingredient quality. So how did this man-vs.-Yelp challenge turn out? The series ended in a 2-2 tie, but with Little Donkey advancing to Round 2, man scores a narrow win on point differential. El Farolito in San Francisco leads the nation with a VORB score of 20.7.